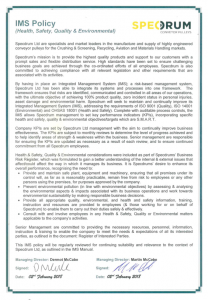 Specdrum Ltd has developed an IMS Policy to provide governance for all IMS operations. The IMS Policy demonstrates Managing Directors & Senior Managements commitment to the development, implementation and continual improvement of the Integrated Management System. The IMS Policy defines Specdrum Ltd.’s Integrated Management System in terms of goals & objectives/KPIs, HSQE Responsibilities & compliance obligations, continual review & improvement and Specdrums commitment to meet the needs & expectations of all its interested parties.